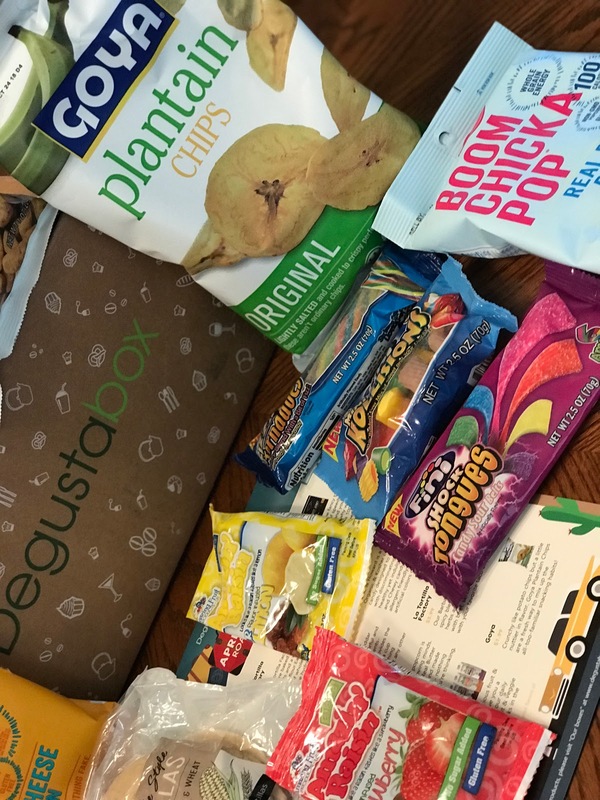 I love subscription boxes. And I have unboxed so many. I love when they are themed with either the season or common things that are happening around that time. 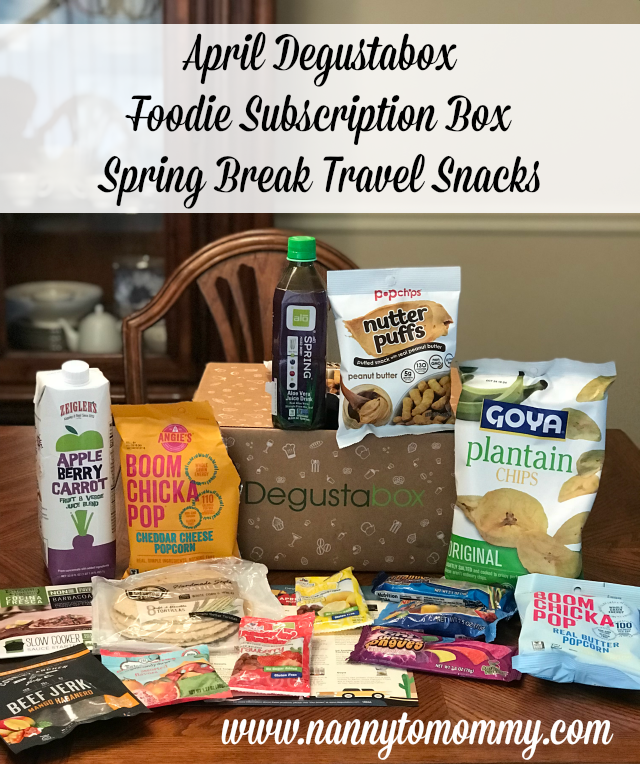 Like this box was all about Spring Break Travel Snacks! 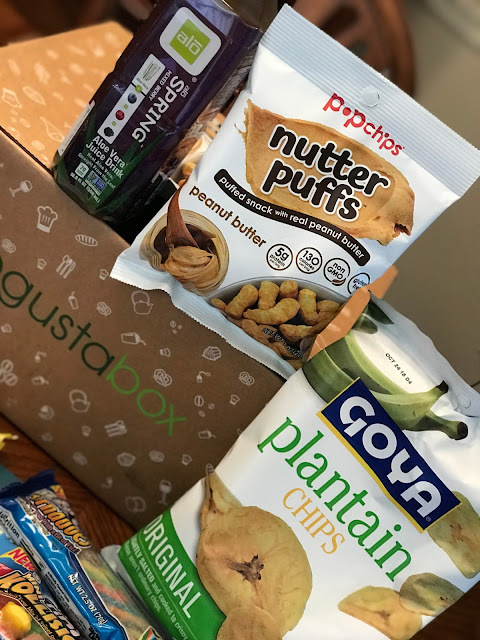 So, what is Degustabox? Degustabox is an on-line food subscription service that delivers a monthly surprise box containing the latest and best products, from small and big brands alike, to the homes of the consumer: saving time and money. You can cancel anytime. So what was in the box? ALO Spring. Spring is an awakening. Sunshine and rain feed the berries that bloom to create nature's desert for the soul. Real aloe vera juice and pulp, straight from the leaf, blended with cranberry, mulberry and blueberry juices, combined with the best of ALOTones, brings a positive boost to body and mind. Torie & Howard is a producer of USDA Organic & Kosher certified, Non-GMO candy designed to satisfy customers with discriminating palates who crave healthy yet indulgent snacks. Their Hard and Chewy candy lines are vegan, Big 8 allergen friendly; gluten free, no artificial colors or flavors. La Tortilla Factory handmade style tortillas are baked only with Non-GMO ingredients and a unique blend of corn and wheat flour. Each tortilla s packed with 14 grams of whole grain and contains no bad fats (like hydrogenated oils). Country Archer Jerky Co. "How's your Latin? No, not the fancy talk lawyers use to get you out of speeding tickets. How's your passion and your love of all things caliente? That's why we went all "Mango Habanero" on this 100% grass-fed beef jerky. It's a sweeter, more sophisticated way to spice things up." popchips nutter puffs. NEW nutter puffs from popchips, it's peanut butter perfected!" If you are looking for that peanut butter taste, but don't want a heavy feeling afterwards, then this is the perfect snack! Angie's BOOMCHICKAPOP. Cheddar Cheese Popcorn is hugely flavorful and made with real, simple ingredients-nothing fake. Real cheddar provides the cheesy flavor and 70 calories a cup provides the conscience-soothing snacking. We wouldn't have it any other way. Real Butter Popcorn. Attention butter lovers! This popcorn is going to blow your minds. Only 45 calories a cup! Amazin' Raisin is an All Natural, fruit flavor-infused raisin with No Added Sugar! Amazin' Raisin is Gluten Free, Vegan, Peanut & Tree Nut Free and Certified Kosher by the Orthodox Union! Available in 7 mouth-watering fruit flavors, Amazin' Raisin is a naturally sweet, health-conscious treat for the whole family. La Tortilla Factory. Their Barbacoa slow cooker sauce is a spicy blend of smoky chipotle, Mexican herbs and a hint of lime juice. Prepare with beef, serve on soft tortillas and top with your favorite taco condiments. Fini Shock Tongues Chewy Candy. Try this chewy candy with 6 amazing flavors! Enjoy separate or combined! Perfect balance of sour to appeal to all! Kollisions Chewy Candy. 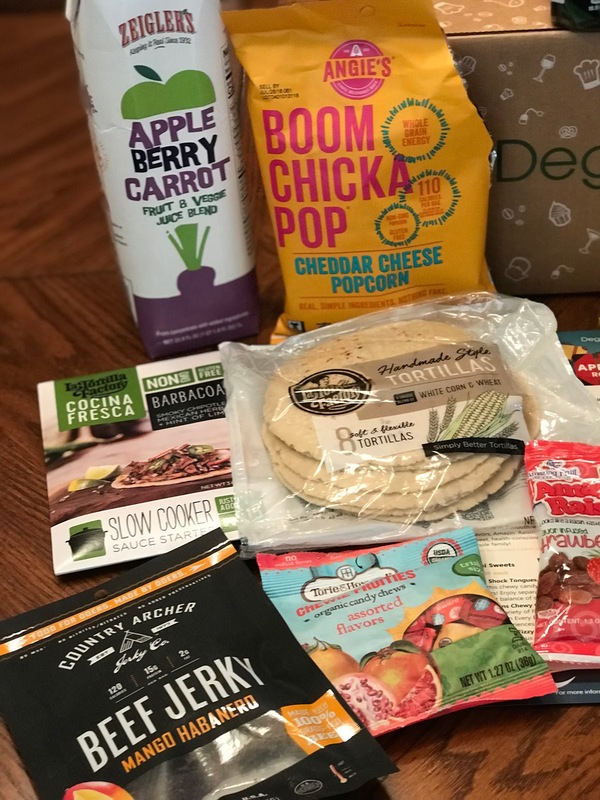 A FUN Variety of Flavors, Shapes, & Textures in Every Bag! Provides multiple taste experiences. Tornadoes Fizzy Chewy Candy. try the delicious blend of 6 berry flavors. Each chewy, hallow rope has a fizzy texture! Zeigler's. "We blended up some delicious fruit & veggie combinations to give you a power packed dosage f your daily fruits and veggies. Our fruit & veggie blends packed in Tetra locks in the nutrients and freshness. Goya. Crunchy like potato chips but a little nuttier in flavor, Goya Plantain Chips are a fresh way to mix up the all-too-familiar snacking habits! The retail value of this box was around $33 and my readers can score a box of your own for only $9.99 (normal price is $19.99) plus free shipping AND a FREE gift too! Just click HERE and enter J0HJB in the promo code section. What do you think of Degustabox? I received complimentary products to provide this review. All opinions are my own. This post contains affiliate links which means I make a small commission while you still get the same great prices! Thank you for supporting my blog. Yum, all of the snacks you received sound delicious! I love trying new things. :) I wish that I could sign up for this box, it definitely seems worth it! I love this idea. Saves you time of packing snacks, and I love the bananna chips! yum! some good stuff in that box! I have already tried the Goya plaintain chips, and will have to look for the tortillas from La Tortilla Factory because hubby likes fresh, tasty tortillas and well, I can't make them from scratch too well! lol. Love the idea! But I'd have to clear all the other snacks out of the house or we'd be 3x the size! What a fun variety of products! I've had the Nutter Puffs before and they were good. I love the Boomchickapop! The tortillas would complement my chicken salad as well! There’s a lot of good stuff in the box. I definitely want to try it! The tortillas and slow cooker sauce look awesome!